If you want to help me make May Britt's 50th birthday a spesial one, pop over to her blog and leave a note. The big celebration will be on saturday. This weekend I have really worked hard doing echoquilting on two projects for Quiltemagasinet (a Norwegian Quilting Magazine). I'm very pleased with the result and hope the readers of the magazine also will be when the projects are published. 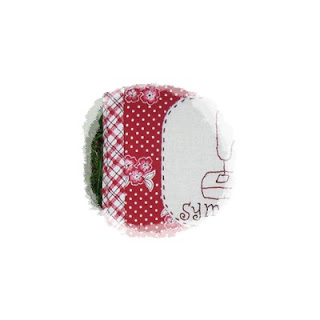 While doing quiltwork my mind kind of wandered off and I got a great idea for a new project. I wanted to start right away, but got grip of my self and finished quilting before I started drawing. Drawings are ready and tomorrow morning I'll start right after a visit to to my doctor. No no no, I am not sick (apart from the diagnoses I've already received). Just have to renew some prescription medication. Time to update my list of finished projects in September. The update list is on my sidebar. This Pillow is from my jeans cutting earlier this summer. Front part was compleated in July, but for unknown reason the back part have been missing. I put it together last week. Cleaning out my attic some months ago I found some cross stitch work I made many many years ago. This one had a misshap in the cleaning prossess. I do plan to make it work in a project. I will get back to that project in October. Back to my sewingmachine! I have work to complete before Ocotober 1. Sneek peek will be postet during the week end. Time to give you an update on what I've been working on. This is my latest pattern. Folder and pincushion for sewingmachine needles. The folder have 12 pockets for sewingmachine needles. Innside it looks like this. 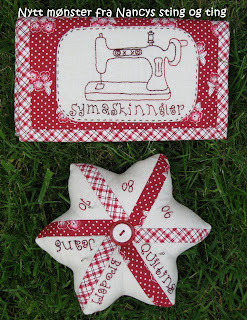 I've used beautifull red & white fabrics from Chelsea Manor by Bunny Hill. I'm so excited. I have been working hard on a new pattern. This is just a little sneak peek. Pattern soon to be published. Sorry only in Norwegian. 10 days ago I went to Tysvær to give classes in making My sewingbag. 9 ladies participated, but only 7 present when this photo was taken on sunday. Great group. Tysvær Husflidlag had a great location for classes. Absolutly perfect. Here are some of the bags. I dropped by my mom on the way forth and back. Stayed a cople of days. Mom had signed up for classes here in Grimstad last weekend, so she came along when I returned to Grimstad. We went for a walk in the woods picking mushrooms and had some days for sewing. In this photo mom is getting ready for her handbag class with designer André Wallenborg. Yes, painting her toe nails!